-A plug-and-play wireless receiver, No hassle setup, simply plug into your computer's USB port, there's no software to install. -About pointer: hold down the button to keep the light on. ●Do not direct the beam at people, animals or any flying objects, moving vehicles and any public or private structures. 【Support Hyperlinks】- Wireless Presenter combines the functions of a red light , page up, page down, play slides, black screen for PPT presentation; Through Tab and Enter button, the wireless presenter supports hyper link in the PowerPoint; Through Tab button to switch window. 【Easy to Use】-The presenter is perfect for speakers, students, teachers, lecturers when it comes to delivering talks & presentation. It has all the functions you would expect and is super easy to use without the need to take your eyes of your audience. 【Plug and Play】- No need to install drivers, just plug the RF receiver into a USB port and the device installs itself in seconds. 2.4G universal channel. 【Humanized Design】- Environmentally friendly ABS plastics; Scientific ergonomic design; Comes with auto standby and deep sleep functions for energy-saving and durable use, and equipped with a separate switch and effectively avoids unwanted power consumption when you put it in your bag. 【Support Options】- Supports MS Word, Excel, PowerPoint, ACD See, Website, iWork (Keynote & Numbers & Pages) etc; For MacBook on OS, plug the usb receiver into laptop, it will come out a box, and then you can select 101 or 104 option. 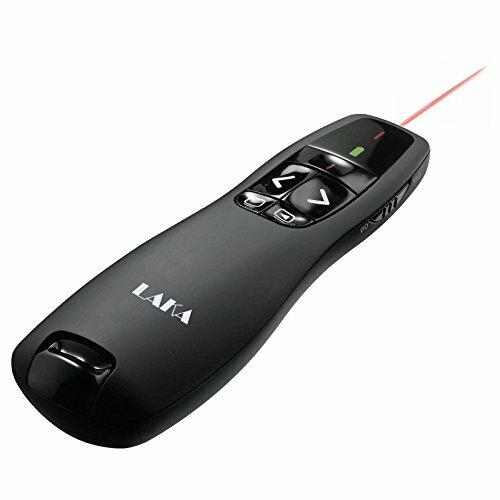 If you have any questions about this product by LAKA, contact us by completing and submitting the form below. If you are looking for a specif part number, please include it with your message.